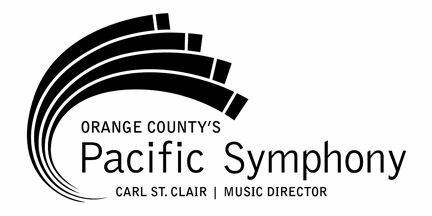 Pacific Symphony, led by Music Director Carl St.Clair, is the largest orchestra formed in the United States in the last 40 years. Recognized as an outstanding ensemble making strides on both the national and international scene as well as in its own burgeoning cultural community of Orange County. The Symphony offers moving musical experiences with repertoire ranging from the great orchestral masterworks to music from today’s most prominent composers, highlighted by the annual American Composers Festival. With a vision for the future, the Symphony is dedicated to developing and promoting today’s young and established composers and expanding the orchestral repertoire. This commitment to new works is illustrated through the Symphony’s commissions and recordings, in-depth explorations of American artists and themes at the American Composers Festival. The Symphony’s innovative approaches to introducing new works to audiences received the prestigious ASCAP Award for Adventuresome Programming in 2005 and 2010. In 2009, the League of American Orchestras named the Symphony as one of five innovative orchestras to be profiled in an in-depth study. The Symphony’s award-winning education programs are designed to integrate the Symphony and its music into the community in ways that stimulate all ages and form meaningful connections between students and the organization. St.Clair actively participates in the development and execution of these programs. The orchestra’s Class Act residency program has been honored as one of nine exemplary orchestra education programs in the nation by the National Endowment for the Arts and the League of American Orchestras. Added to Pacific Symphony Youth Orchestra on the list of programs in 2007-08 were Pacific Symphony Youth Wind Ensemble and Pacific Symphony Santiago Strings. Presenting more than 100 concerts a year and a rich array of education and community programs, the Symphony touches more than 275,000 Orange County residents—from school children to senior citizens. In addition to its winter home, the Symphony presents a summer outdoor series at Irvine’s Verizon Wireless Amphitheater, the organization’s summer residence since 1987.